THE WELL-PUBLICISED Kecksburg, Pennsylvania UFO crash of 1965 has been touted as "Pennsylvania's Roswell" and presented as a crash recovery story that has been shrouded in a veil of mystery and governmental conspiracy which is intended to keep the truth of the incident from the American people. But, Lackawanna County's city of Carbondale, Pennsylvania is also the location of a "downed saucer incident" that has caught the imagination and interests of ufologists and conspiracy enthusiasts throughout the nation. 9-11 November 2004 marked the 30th anniversary of Pennsylvania's other Roswell incident. - the legendary Carbondale UFO crash or perhaps, I should call it "The Carbondale UFO Capers". I was working quite late on the night of 10 November 1974 (on a design project) and had sketches and blueprints scattered about on the dining room table and floor. It was a little after midnight, (actually 11 November) and I had been listening to a local radio talk show when the programme's host suddenly announced that his programme director had just handed him a note about an unidentified flying object which had apparently crashed at Carbondale, Pennsylvania. Since I had appeared on WWDB's Bernie Herman show several times discussing the UFO phenomenon, I phoned the station without hesitation and asked if the matter was legitimate or simply a prank. Both the show's host and his engineer assured me that the report was indeed "authentic" for they had just taken it directly from an Associated Press release. The youngsters agreed that a fiery object had fallen to earth in a shower of sparks and splashed down into a large coal breaker pit or 'silt pond', as it was called by locals. The police had cordoned off the area in an attempt to keep curiosity seekers from possibly getting injured at the site, as two areas of the bank of the pond were rather steep and slippery. The acting police chief, Sgt Francis X. Dottle, confided that he didn't know what the object in the water was, but that he and a couple of his men had observed it glowing while submerged on the night of 9 November - and that it remained aglow until the wee morning hours of 10 November (i.e. for a period of about six to eight hours. As I later learned, the teens who observed the phenomenon saw a fiery object streak across the sky, "Coming over Salem Mountain" in the direction of Russell Park. According to the boys, they ran into the park from their street corner location where they were just hanging around on a "nothing else to do" Saturday night and discovered a strange light glowing in the pond about twenty feet. from shore. The boys had run about two blocks to the pond and didn't actually see or hear the object hit the water. There was a faint "fizz" or sizzling sound heard, however, and one of the lads said that "it sounded like someone had thrown a cigarette in the water." So, too, one boy thought the pond had an odour "like gas from a gas stove", while another boy said that "the pond just smelled like it usually does". The mysterious airborne object was described as being bright whitish-yellow in colour with a trail of reddish sparks. It was estimated to appear about as large as a five cent piece (a nickel) held at arm's length. But one of the boys would later say that it was about "three times the size of a basketball". No sounds were noted by the teens as the object appeared to fall towards the earth, and they didn't see a trail of smoke coming from it either. One boy said, "It looked like a shooting star". However, later versions of the story credit the boys with saying the object whistled as it sped earthward. The boys left the pond to report the submerged light to the police about 7:00 p.m. and when they returned to the pond (around 15 minutes later) they thought that the light had taken up another position in the water, although no one actually saw the light moving at that time. The light was described as being yellow-orange in colour by two of the boys, while the third witness described it as "yellowish, almost white". The light on the water's surface appeared as an irregular disc about 5 feet in diameter. While several UFO researchers would later describe it as being an irregular shaped glow at 20 feet in diameter, I performed a very simple experiment with a flashlight in a darkened room and discovered that the central portion of the light's beam appeared to be about five feet in diameter (when directed at the ceiling) and its outer, fainter, and more widely dispersed light beam was about 4 times larger. This may account for the discrepancy in the estimates concerning the diameter of the glow on the pond's surface - or perhaps, the later researchers may have misinterpreted the boys' statements regarding the "position" of the light from shore, which was initially reported to be about twenty feet. I asked the officer on the phone if the object might have been a small private plane, fearing that someone may have been trapped in an air-pocket within the fuselage's wreckage. He said that the reports indicated that the object's tremendous speed and the lack of floating debris on the water seemed to deny that possibility. I then asked if the object could have been some sort of "space junk" and informed him that there were military tracking installations such as NORAD that should be contacted in regard to the situation. My primary concern was that if the object were some part of an American or Soviet spacecraft or satellite which hadn't completely burned up as it re-entered the Earth's atmosphere, there may have been a possibility that some portion of its electrical system was still being powered by the "snap units" (or nuclear batteries) that were used to power various on-board instrumentation and guidance systems. This seemed to be highly improbable, but, then again, there was that strange light beneath the pond's surface, a light which appeared to pulsate with diminishing intensity and at one point suddenly rushed towards a small boat which police had launched to further investigate the matter. But, unknown to me at that time, Sgt Dottle (the Acting Police Chief) had already been in contact with Dr J. Allen Hynek's Center for UFO Studies in Evanston, Illinois about the situation. Dr Hynek advised Sgt Dottle that a meteor or a meteor fragment could not be the source of the light in the pond because burning meteors are immediately extinguished when they strike bodies of water. Sgt Dottle was further advised to obtain a Geiger counter to see if any radioactivity was present at the crash site, perhaps as a result of a faulty spacecraft or satellite re-entry. As I drove through the Lehigh Valley I was still listening to radio news reports concerning the incident - and while some of the accounts seemed to be a bit sketchy, there were relatives of Carbondale residents phoning the radio station with additional information and some obvious rumours too. There was also a rumour that an alien space ship had landed - not crashed - in the silt pond and that the military had managed to recover whatever was in the water and spirit it away before anyone had an opportunity to see it (i.e., the story was beginning to take on characteristics of the earlier Kecksburg, Aztec and Roswell UFO crash reports). In one rumour scenario, the UFO was loaded upon a flatbed railcar that was brought to the site on a nearby (albeit, long abandoned) railroad spur - and in another account, two military helicopters were used to lift the object from the water and place it in an armoured truck. Many of our reports were passed on to us by technicians at the Philadelphia Franklin Institute's Fels Planetarium, several police departments, both commercial and military air facilities and two local newspapers - while direct calls from the public were also received and routinely investigated. As I entered the community of Carbondale, about 4:30 - 5:00 a.m. on the morning of 11 November, I asked directions to the police station and briefly conferred with detective sergeant Dottle. He informed me that Dr Hynek was dispatching a UFO field investigator from New York State to assist the police in their efforts to identify and possibly recover the object in the pond. Sgt Dottle then asked if I would assist him until Dr Hynek's representative arrived and I agreed to do so. I was then taken to the crash site which was cordoned off by two Carbondale police officers and a group of youngsters who were members of the Civil Air Patrol (i.e., aeronautical boy scouts). There were not any armed troops or technical military contingents of any kind present. But I did briefly speak to an Air Force officer (a major or lieutenant-colonel) at the pond much later in the day. I believe that he was involved with the Civil Air Patrol's community service related activities at the scene. I think that the officer's name tag read "Merriman". (?) Anyway, several volunteer fire companies from neighbouring communities were summoned and they assisted in the recovery efforts by pumping thousands of gallons of water from the pond as Sgt Dottle, Dr Hynek's investigator, Mr Dains, Mr Barry of the 20th Century UFO Bureau and I felt that this was a far safer method of obtaining a look at the submerged object than permitting a scuba diver to enter the water. It looked just like a scene from a science fiction movie and fears grew that emergency vehicles could not have got through if they were needed. To make matters worse, although we hadn't a ghost of an idea of what was actually in the water, rumours were spreading like a brush-fire and a few very vocal UFO enthusiasts who were milling about at the site were questioning the effectiveness of the police, fire companies and UFO researchers' retrieval efforts. Sgt Dottle began to fear that some minor incident involving the control of the crowds might spark a riot (or a panic) that his small police force couldn't possibly handle. Sgt Dottle found himself caught in the rather unenviable position of being damned if he did and damned, still, if he didn't do what everyone expected of him. He wanted to ensure the safety of the public, his men and the volunteers at the pond, while the media and the saucer buffs in the crowd were chomping at the bit for a quick and spectacular climax to the story. The pressure and anticipation were building with each passing hour, and while Mr Dains and I shared Chief Dottle's concerns about safety, we were also concerned that the mysterious object in the water be spared from loss or damage by our recovery efforts. Of course, not everyone was on the same page (i.e. thinking about safety and the preservation of evidence). I distinctly recall one persistent and annoying fellow asking me why we hadn't used more fire companies to do the pumping. When I replied that we didn't think it necessary (or prudent) to leave the surrounding communities without adequate fire protection, he grew visibly agitated and said "Well, you should be digging for that damned flying saucer now that the water level is down a bit!" Somehow, I knew that no matter how far we dug, if we still hadn't found anything, this guy would be saying, "Just two more feet and a bit to the left!" In fact, Sgt Dottle had requested the use of a large crane fitted with a massive magnet (i.e., the type used at auto salvage yards) since the pumping operations which commenced a little before noon hadn't been very successful, and were taking far longer than anticipated to complete. I told Stamey that I hadn't the authority to do that and suggested he speak to Mr Dains or Chief Dottle about his dilemma. I later observed Stamey preparing his diving equipment and assumed that the question of his parole status had been straightened out. So, after briefing him on the scant information we had gathered and conveying our concerns that the object might still be electrified and/or radioactive, the diver slipped into his wet suit and prepared to enter the silt pond. The UFO researchers were being interviewed by the press and a TV station's helicopter circled the pond churning up the water. Although we still hadn't any solid information on what the object in the water might be, Dr Hynek's representative and I were starting to suspect that the incident might be a prank that the teens had perpetrated on a nothing else to do Saturday night whim. We thought that perhaps their hoax simply got out of control and took on a life of its own - and that the boys may have been too scared to fess up to what they had done. Of course, it may have been that the boys had witnessed a meteor or a bolide (a large and occasionally exploding meteor) streaking across the night sky and mistakenly assumed that it was the same luminous object that they discovered moments later in the pond. This seemed to be a reasonable notion, as the boys' description of the aerial phenomenon they had observed was absolutely meteoric in character. In fact, I had very similar reports on file at the UFO report and information centre, reports that were later verified by technicians at the Fels Planetarium. One report stated, "About twenty stories overhead, a white fiery object with a red light on the underside about centre -flying east to west - it had sparks on the sides and coming from the rear section." The sighting duration was 15 seconds. (Mr Sanford Epstein, Levittown, Pennsylvania, 14 June 1974 - 9:15 p.m. EST). Moreover, while attempting to discover who had perpetrated the hoax (if one had been committed?) was one of the field investigator's tasks, it was quite naturally, primarily a police matter as a great deal of the authority�s time and resources were expended during the 44 hour UFO drama. The UFO researchers� interests and responsibilities were to identify the object (if possible) and to preserve any evidence found from damage or loss (if possible). They would also gather eyewitness testimony on the incident to be used in later evaluation and analysis of the matter and in determining the veracity of the witnesses. But in the Carbondale case, the researchers were also presented with the opportunity and distinct privilege of working with the community's authorities towards a safe and successful resolution of the incident. Unlike other "downed UFO incidents" where UFO investigators and civilian volunteers were reportedly turned away from the area by the military and police officials, such was definitely not the case at Carbondale. According to the boys, John Lloyd, 14, William Lloyd, 16, and Robert Gillette, 15, the object that they observed coursing through the evening sky was a relatively ill-defined flaming mass with a shower of sparks trailing it as it rapidly travelled on an east to west course. Report sketches provided by the Lloyd brothers show an oval object with the descriptive words "red, yellow and white" printed under the drawing. But an earlier drawing by Bobby Gillette looks something like a lens seen on its edge - Gillette's object also has a red dot in its centre. The teenage trio did not hear any sounds coming from the object as it descended, according to their first oral and written accounts - nor did the boys actually see it plummet into the pond. But one of the lads would later say that he saw cinders falling from it. There wasn't any obvious displacement of earth; there was no displacement of water from the pond; there were no indicators of a fire, downed tree limbs or skid marks creating a gouge in the soil like the one which is said to have been evident at the J.B. Foster ranch near Roswell, New Mexico in 1947. Interestingly, the details of the Roswell UFO story were not very well known by the general public or the press corps at the time of the Carbondale incident, but the reported UFO crash at Kecksburg in the western part of Pennsylvania had occurred nine years earlier and had received some attention by the press. 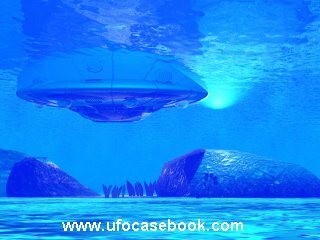 But Carbondale's UFO (as a structural configuration) was not observed on the ground or while it was in the water. No one knew if it was a disc, a sphere like Sputnik or a cylindrical craft of some kind. There was just the glowing 5 foot circle of light on the water which the boys said had sizzled or softy hissed for several seconds. In the pandemonium of the harrowing moment, the officer lost his balance and fell out of the boat into the silt pond which was said to have had a bottom like quicksand! I was unable to confirm this story with police officials at Carbondale back in 1974, but a deputy sheriff from the neighbouring community of Honesdale, Pennsylvania later told Ohio MUFON's chief researcher, Mr Larry Moyers, that Officer Joseph Jacobina (or Jacobino) had fired six shots at the on-rushing light. When the pole was retracted from the water, it was noticed that the fish net on the end of it was slightly torn. But, the effort was not completely in vain as it was also noted that the 5 foot in diameter disk of light on the water's surface appeared to emanate from a much smaller point of light at the bottom of the pond. When Mr Dains took water samples from the pond, I was surprised to see that the water was basically clear and one could see for about a depth of 3 to 4 feet into it. I observed a discarded auto tyre, bits of trash and a sunken vehicle's roof and hood areas. Of course, looking at the daylight reflecting off the water's surface made the water appear to be more opaque, and at certain angles the pond's silt floor appeared to give the water a brownish-grey cast. The water was indeed polluted, but it wasn't very discoloured. Naturally, when the pond's silt and muddy bottom were disturbed the water did become very cloudy and murky-looking. The pond was an abandoned coal cleaning breaker pit that had managed to fill up with rain water over the years. Mr Dains and I also walked around the pond with instruments to detect magnetic disturbances; none were noted. This cone-of-light seemed to be consistent with Sgt Dottle's early suspicions that the object was probably a flashlight. Moreover, Officer Trella's remarks that the object seemed to be too heavy to be a flashlight were based on the difficulty that he experienced while attempting to lift the object in the net on the end of a 10 foot long pole. In fact, he may have even been struggling with other debris, mud and silt on the pond's bottom at the time (?). Anyway, it seems that the light in the water was visible for a period of six to eight hours - depending upon one's acceptance of the boys' reported discovery time or the initial observation of it by the Carbondale police. (i.e. from 7:00-9:00 p.m. on the night of 9 November to approximately 3:00-3:30 a.m. on the morning of the 10th).